Orientation leaders are OKCU student leaders who are committed and motivated to connecting new students to the campus community. 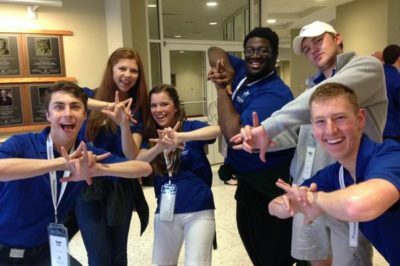 They help new students find their home on campus through leading groups at Stars101s, serving as Stars Group Leaders during Stars Week, and as volunteers at many of the new student events! Orientation leader applications open every November and interviews take place when school starts again in January! (1) January: Get to know each other and learn more about what being an NSO Leader is all about! (2) April: Train for Stars101! (3) August: Train for Stars Week! There are two Stars101s in April and two in June; and Stars Week takes up a whole week in August! Outside of those listed dates, responsibilities are minimal and we make sure all trainings and activities are fun! NSO Leaders are explained above. This is a volunteer position to help new students and join-in on all of the fun Stars Week & Stars101 activities! Any undergraduate student in good standing with the university, who isn’t graduating in May of the current academic year, is welcomed and encouraged to apply! NSO Staff are paid positions for students to help organize and facilitate major components of FYE activities. All NSO Staffers must have served as an NSO Leader in a previous year, must be in good standing with the university, and cannot graduate in May of the current academic year. Assists in the planning of all NSO Leader trainings, communicates with the NSO Team, oversees Stars Group activities and plans/facilitates the Traditions Rally. Ideally, this position will go to someone who has experience with summer camps and is familiar with the Stars Week/NSO Experience. Assists in the planning of Stars101s, communicates all Stars101-related information to the Team, works with Undergraduate Admissions to coordinate all volunteer activities for the day, plans Stars101 NSO Leader Training. This position is highly logistical and will go to a leader who demonstrates interest in “behind the scenes” planning and strategy. Oversees all social and strategic media from FYE for the new incoming class. This includes, but is not limited to, overseeing the Class of Facebook page, FYE Snapchat, and FYE Instagram account. This may also include creating videos, and other online communication from FYE to new students. This is a great first-time event planning position. Plans the annual Open Mic Night event during Stars Week. Plans the OKConnect trips during Stars Week. This includes communicating with all businesses and trip-goers, marketing the event, and creating a clear communication and logical travel plan. This requires leaders who are quite experienced and comfortable in event planning. Sits on the OKCU Reads Selection Committee as a student-panelist, helps communicate OKCU Reads events and activities, coordinates author visit, and assists in the judging of the MUSINGS contest. This requires leaders who enjoy reading and feel comfortable in meetings with faculty and staff members. Plans the annual Scooby Doo @ OKCU event during Stars Week. Reaches out to local businesses for Sponsorship opportunities for Stars Week activities. This includes coordinating pickup for in-kind donations, being the main point-of-contact for sponsors, coordinating with OKCU Advancement Office, and making cold-calls. This requires a leader who is self-motivated and comfortable making cold calls and asking for donations. Contact our advisor, Colbi Beam, Senior Coordinator of First-Year Experience at cbeam@okcu.edu.